Is teeth bleaching safe, dangerous, effective procedure? Up until recently, tooth whitening was a very expensive procedure adopted only by famous actors and actresses as well as professionals, who wanted to have a nice and bright smile. Nowadays, the new procedures with laser and the most reasonable prices attracted more people, who are interested and ask their dentists about teeth whitening. Is teeth whitening safe? 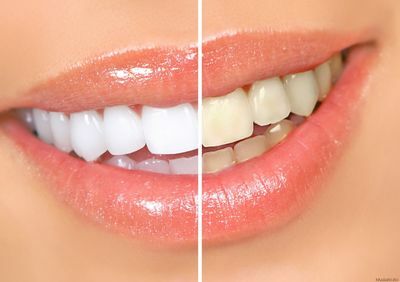 Scientists have dedicated many years in the research of the effects of teeth whitening and concluded that it is, actually, a safe procedure as long as the substances used are certified and checked and the procedure is performed by a dentist or even better by a cosmetics dentist. Many people, especially women ask is teeth whitening safe for children, kids, pregnant, while breastfeeding? These questions cannot be answered with complete accuracy by the scientific community. As long as children are concerned, dentists suggest that the tooth whitening is avoided until the age of 16 since up to this point teeth as well as the rest of the human organs still grow. Scientists are even stricter with pregnant women or women who breastfeed insisting that tooth whitening is postponed to a later stage since the proportions on the ingredients of teeth whitening substances may affect the fetus or the newborn. The best thing you ought to do is to take preventive measures and avoid the procedure at this phase. After all, it’s not an urgent situation and can be postponed for later, so that you can be sure that it won’t affect you or your baby. Is it safe for enamel? Every little intervention on teeth, even the daily brushing may cause some small damages to the enamel. The answer to the question lies to the frequency of each method. Exaggerations have consequences and, therefore, if you are overdoing it with repeated visits to your dentist for teeth whitening, then the answer would be yes, it’s not safe. On the other hand, if you follow the rules, you will have no problems with your enamel. The most common question about the teeth bleaching is that: is a laser tooth whitening permanent? Or even, is zoom teeth whitening permanent? The answer is negative. Certainly, the most modern procedures can have more permanent results, but as an overall, there are many factors that constitute to the altering of the teeth color. Don’t forget that your teeth are living organisms and are affected by food, drinks, smoking, and coffee as well as by our regular brushing and cleaning. At best, you will need to undergo a new procedure within the next 3 to 5 years.